With the untimely death of Stanley Grenz in 2005, North America lost one of its most significant and influential dogmatic thinkers. Grenz did his doctoral studies under Wolfhart Pannenberg, and his own constructive work remained deeply influenced by Pannenberg. So it was fitting that, towards the end of his life, he went back and revised his 1990 book on Pannenberg, Reason for Hope. 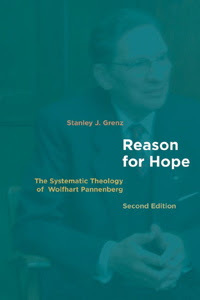 Grenz first wrote Reason for Hope while Pannenberg was still working on his three-volume Systematic Theology. At the time, Grenz produced the first detailed overview of Pannenberg’s entire dogmatics, based mainly on lectures presented in Munich in 1987-88. For this second edition, however, Grenz was able to utilise the complete published Systematic Theology, as well as a great deal of recent scholarly discussion. So although this new edition follows the same basic format as the first edition (an overview of Pannenberg’s dogmatics, together with a critical evaluation of the main debates engendered by each locus of the Systematic Theology), the book is greatly enhanced by its up-to-date engagement with Pannenberg’s own work and with the contemporary scholarly discussion. Grenz is an attentive and sensitive reader, and his analysis of Pannenberg’s methodology is particularly acute. He situates Pannenberg’s mature dogmatics within the context of the earlier methodological works such as Jesus – God and Man (1964), Theology and the Philosophy of Science (1973), and Anthropology in Theological Perspective (1983). And he argues convincingly that Pannenberg’s dogmatics flows from and builds on the methodological programme that had been so rigorously developed throughout the 1960s, 70s and 80s. Further, Grenz is alert to changes and developments within Pannenberg’s thought, and he points out many instances in which Pannenberg has revised his earlier ideas in light of ensuing criticism and debate. Notably, Pannenberg’s christology underwent major methodological and material change between Jesus – God and Man and the Systematic Theology. And even more strikingly, his approach to the doctrine of God changed radically: earlier, Pannenberg had viewed the doctrine of God only as the final task of dogmatics; but by the time of the Systematic Theology, he had gained “a new-found confidence to develop the doctrine [of God] itself and to treat the other subjects of dogmatics from its perspective” (p. 57). Indeed (as LeRon Shults has also argued), this orientation of all theological themes around the doctrine of God is the fundamental structuring principle of Pannenberg’s thought. Since God is the all-determining reality, the task of dogmatics is “[t]o show the illuminating power of the Christian conception of God” (p. 7). By proceeding in this way, Pannenberg offers an ambitious attempt “to give reason for the hope” (1 Pet. 3:15). Thus his whole dogmatic theology seeks to combat “the dominant trend toward the privatization of religious belief” (p. 290). This second edition of Grenz’s work is a welcome contribution to the ongoing discussion of Pannenberg’s theology. Although scholars like Chris Mostert and LeRon Shults have more profoundly explored the underlying grammar of Pannenberg’s thought, Reason for Hope remains the most lucid, reliable and accessible introduction to the work of our most brilliant contemporary theologian.